There is nothing quite like an acknowledgement from the technical community. 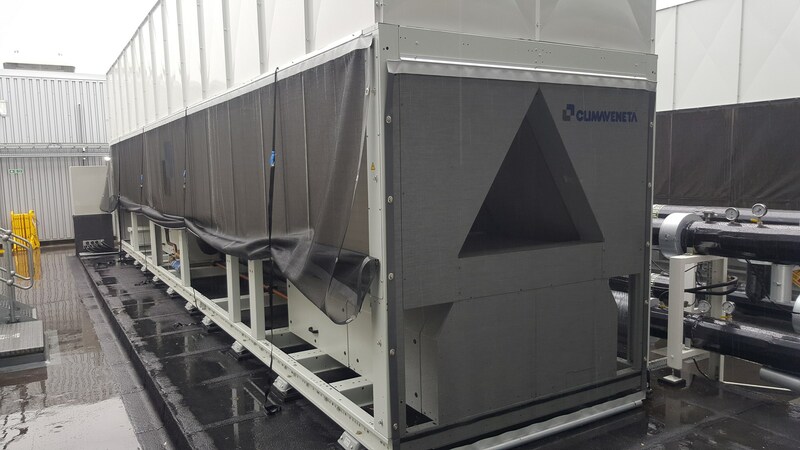 Following several installations of the RABScreen at datacentres run by an international bank, their consultants are now specifying our products on all new and replacement cooling systems. These datacentres form a critical link between the bank and its customers and the cooling plant must always be protected from dust and debris to minimise coil clogging and prevent fin damage..
A recent asset replacement programme has seen four new Climaveneta chillers installed with two Cooling and Condenser Dry Air coolers planned for November. Each unit has, or will be, protected by the RABScreen filter with the final Climaveneta using the unique RABScreen CAS system. The DAC’s will also be protected with the RABScreen Winter Curtain which will be deployed to minimise the further risk of coil freezing in a system that does not use Glycol. Another data centre chiller protection filter installed by RABScreen.